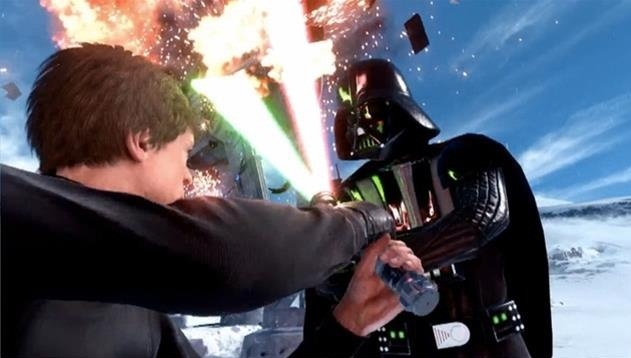 The open beta of Star Wars Battlefront is started and you can compete in the iconic "Star Wars”. Here will show you how to become Luke Skywalker and Darth Vader. In Walker Assault, powerups can be found scattered around the battlefield that give you different bonuses when gathering. This you can then simply enable by pressing the two front shoulder buttons on the controller (button 4 on PC). One of these power-ups can be Luke Skywalker (rebel) or Darth Vader (Empire). The power-ups are slightly transparent and not always easy to recognize on the snow-covered ground, but they are shown as symbols when you are in the vicinity. The Power-Up is symbolized by a circle in the background with previously mapped lightsaber. As Luke Skywalker or Darth Vader you constantly lose life and this can only replenish through the elimination of enemies. So you can theoretically run around indefinitely as a hero or villain, if you can find enough opponents and you will not do in advance. Even Luke and Vader are not immortal and they die easily. Then, the power-up is released again and respawn on the map. Activation of the hero powerups by the way is audible for all initiated by the Star Wars theme. Luke moves very fast on the battlefield and has a power boost, with which he can sling imperial soldiers. In addition, you can perform a kind of fast-Dash maneuver with him. Just like Darth Vader, he has also a special attack that triggered near Darth Vader, leading to a lightsaber battle. Darth Vader moves a little slower, but powerful attacks. On the one hand he can lift and turn his opponents into the air with awesome power grip. On the other hand he throws his lightsaber like a boomerang, the rebels can kill with one blow.